Rinse the sliced potato under cold water for 30 seconds thendrain well. Melt the butter in a saucepan over a medium heat and cook the onion and potato for 10 minutes, stirring regularly. Add the leeks and cook for a further 5 minutes. Pour in the warm fish stock with the bouquet garni and bring to a simmer for 5 minutes or until the potatoes are tender. Add the cream and milk and continue to heat for a further 10 minutes. To finish the sauce, remove the bouquet garni, then liquidiseand strain the sauce through a sieve into a clean pan. Seasonwith salt and freshly ground black pepper and keep warmwhile you sear the cod. Heat the groundnut oil in a non-stick frying pan over a high heat. Season the fish fillets on both sides with a little salt and place in the pan. After approximately 1–2 minutes (depending on the thickness of the fish), flip the fillets and cook for another 1–2 minutes. Place the fillets on warm plates then, using a hand blender, froth the sauce and ladle it around the fish. Sprinkle with the chopped chives and garnish with the pea tops. 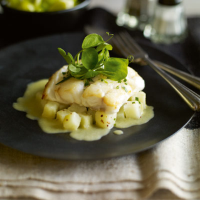 Serve the fish on a bed of diced waxy potatoes, steamed orboiled, dressed with a simple vinaigrette while still warm. Forthe vinaigrette, mix 2 tbsp of Heston From Waitrose Mustardand Shallot Dressing with ½ tsp of the potato cooking water. Also delicious with buttered leeks and green beans. This recipe was first published in Tue Feb 01 00:00:00 GMT 2011.